KDC Members -- Don't forget to send your defense verdicts, along with photos, to the KDC office by May 1, 2019. We look forward to sharing your news with other members of KDC, the Kentucky judiciary and leadership in various other states. If you know any law students that would qualify for this scholarship, please let them know about this great opportunity! DRI announces its annual Law Student Diversity Scholarship Program, open to rising (2019–20) second- and third-year African American, Hispanic, Asian, Native American, LGBT, and multi-racial students. All rising second- and third-year female law students are also eligible, regardless of race or ethnicity. Any other rising second- and third-year law students who come from backgrounds that would add to the cause of diversity, regardless of race or gender, are eligible to apply. Students who are members of the American Association for Justice (AAJ), law school or law student members of AAJ, or students otherwise affiliated with or employed by AAJ are not eligible for DRI Law Student Diversity Scholarships. To qualify for this scholarship, a candidate must be a full-time student. Evening students also qualify for consideration if they have completed one-third or more of the total credit hours required for a degree by the applicant’s law school. The goal of these scholarships is to provide financial assistance to two worthy law students from ABA-accredited law schools to promote, in a tangible way, the DRI Diversity Statement of Principle. See the last page of the application for the DRI Diversity Statement. Applications and all other requested materials must be received by April 8, 2019. Click here to access the 2019 Law Student Diversity Scholarship application. The 2019 Law Student Diversity Scholarship winners will be notified in advance and and the awards presented at the DRI Diversity for Success Seminar and Corporate Expo, June 19-21 at the Sheraton New Orleans. KDC Welcomes Two New Members! Betsy Ryan Catron of Ward Hocker & Thornton, PLLC, Lexington is a graduate of the Salmon P. Chase College of Law. Ms. Catron practices in the area of insurance defense work, and is sponsored by KDC Membership Chair, Ashley Brown. Lauren L. Thompson of Phillipz, Parker, Orberson & Arnett PLC, Lexington is a graduate of the University of Kentucky School of Law. Ms. Thompson practices in the area of insurance defense work, and is sponsored by KDC Jessica Droste. 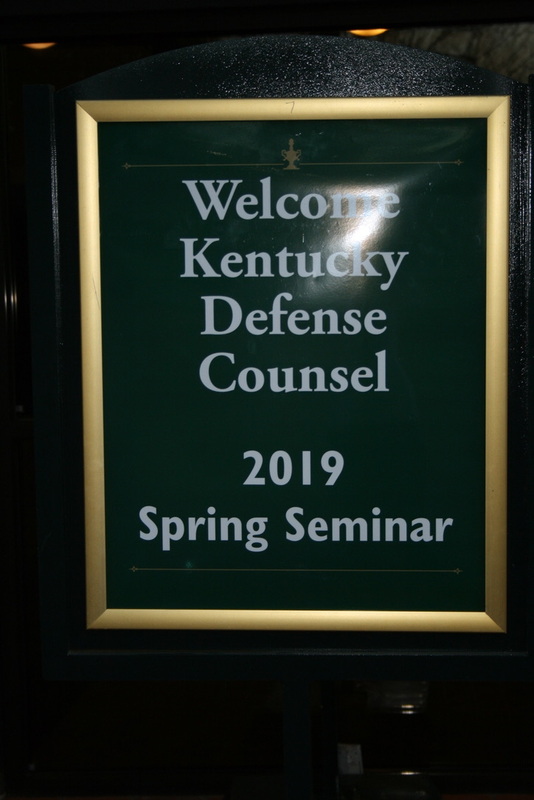 2019 Spring Seminar a HUGE Success! Many thanks to the many participants in the KDC 2019 Spring Seminar. Keeneland was a perfect venue for this year's event. (And what great food!) Thanks to Claire Parsons and Jarad Key for putting together such a great program! And thanks to everyone who brought non-perishable food to be donated to God's Pantry in Lexington. Thanks to our speakers and sponsors -- Zach Berry, David Cades, Christy Cloninger, Michelle Coughlin, Claire Parsons, Tim Potter, Robyn Smith and Alex White -- for assisting us in making it a success. 2019 Fall Seminar, Annual Meeting and Awards Luncheon is scheduled for November 14 & 15 at the Louisville Marriott East. And don't forget our CLE programs. KDC is pleased to welcome Ryan Galloway of Bell, Orr, Ayers & Moore, PSC, Bowling Green. Mr. Galloway is a graduate of the University of Kentucky Law School and practices in the areas of Appellate, Auto, Bad Faith, Business Litigation, Contract, Education, Employment, General Liability, Insurance Coverage, Premises Liability, Tort and Utilities. He is sponsored by KDC Vice President, Paul Lawless. Page 4 -- Gerry Toner of O'Bryan, Brown & Toner, Louisville is recognized for currently serving as the President of the Louisville Bar Association. Page 8 -- An article written by KDC President-Elect, Claire Parsons of Adams, Stepner, Woltermann & Dusing, Covington: The Introvert Lawyer's Guide to Networking. Claire will also be presenting an ethics program at KDC's seminar this coming Friday, Mindfulness for Lawyers. Page 50 -- An article written by KDC Director, Guy Hughes of Casey, Bailey & Maines, Lexington: From Initial Investigation Trial. Page 83 -- Thanks to everyone who has sponsored the eight new DRI members. Page 12 -- An article written by John Trimble of Lewis Wagner, Indianapolis: Tactics for Negotiation. We appreciate each and everyone of you for your great representation for the KDC! Applications and all other requested materials must be received by April 1, 2019. Click here to access the 2019 Law Student Diversity Scholarship application. The 2019 Law Student Diversity Scholarship winners will be notified in advance and and the awards presented at the DRI Diversity for Success Seminar and Corporate Expo, June 19-21 at the Sheraton New Orleans. KDC welcomes its newest member, Scott Guenther of Adams, Stepner, Woltermann & Dusing, PLLC, Covington. Mr. Guenther is a University of Kentucky College of Law graduates and practices in the area of Workers' Compensation. Mr. Guenther is sponsored by KDC Director, Jeff Mando. Michael Joseph LaCourse of Sturgill, Turner, Barker & Moloney, PLLC, Lexington is a graduate of the University of Kentucky School of Law. Mr. LaCourse practices in the areas of Appellate, Auto, General Liability, Insurance, Premises and Torts. He is a member of DRI and is sponsored by KDC Director, Andrew DeSimone. Taylor Margaret Shepherd of Ward, Hocker & Thornton PLLC, Lexington is a graduate of Capital University Law School. Ms. Shepard practices in the area of insurance coverage. She is sponsored by KDC Member, Ashley Brown. Licha H. Farah of Ward, Hocker & Thornton, Lexington is a graduate of the University of Kentucky College of Law. Mr. Farah practices in the areas of Auto, General Liability, Municipal and Premises. He is a member of DRI and is sponsored by KDC member, Ashley Brown. Brian Michael Gudalis of Ward, Hocker & Thornton, Lexington is a graduate of the Regent University. He practices in the areas of Auto, Business Litigation, Commercial, Insurance, and Nursing Home. He is sponsored by KDC member, Ashley Brown. George Bowling Hocker of Ward, Hocker & Thornton, Lexington is a graduate of the University of Kentucky College of Law. Mr. Hocker practices in the areas of Auto, General Liability, Insurance, Premises, Product Liability, Tort & Trucking. He is a member of DRI and is sponsored by KDC member, Ashley Brown. John O. Hollon of Ward, Hocker & Thornton, Lexington is a graduate of the University of Kentucky College of Law. Mr. Hollon practices in the areas of Auto, General Liability, Insurance, Medical Malpractice and Tort. He is sponsored by KDC member, Ashley Brown. Maxwell David Smith of Ward, Hocker & Thornton, Lexington is a graduate of Samford University. Mr. Smith practices in the areas of Auto, General Liability, Municipal, Premises, Tort & Trucking. He is sponsored by KDC member, Ashley Brown. Donald Cameron Walton of Ward, Hocker & Thornton, Lexington is a graduate of the University of Kentucky College of Law. Mr. Walton practices in the area of Workers' Compensation. He is sponsored by KDC member, Ashley Brown.